Ripple's XRP has seen gains of more than 4,000% in the past year, but recent slumps have wiped out more than half its value in less than two weeks. The declines have been fueled by possible regulatory clampdowns on cryptocurrencies in Asia, a major focus for the company. Ripple’s XRP token has been falling for almost two straight weeks as news of possible regulatory ramp-ups in both South Korea and China bring a relative chill to red-hot cryptocurrency markets. The token hit an all-time high of $3.31 on January 4, according to Markets Insider data, before sliding 62% over the next 10 days to land at just $1.23 Tuesday afternoon. 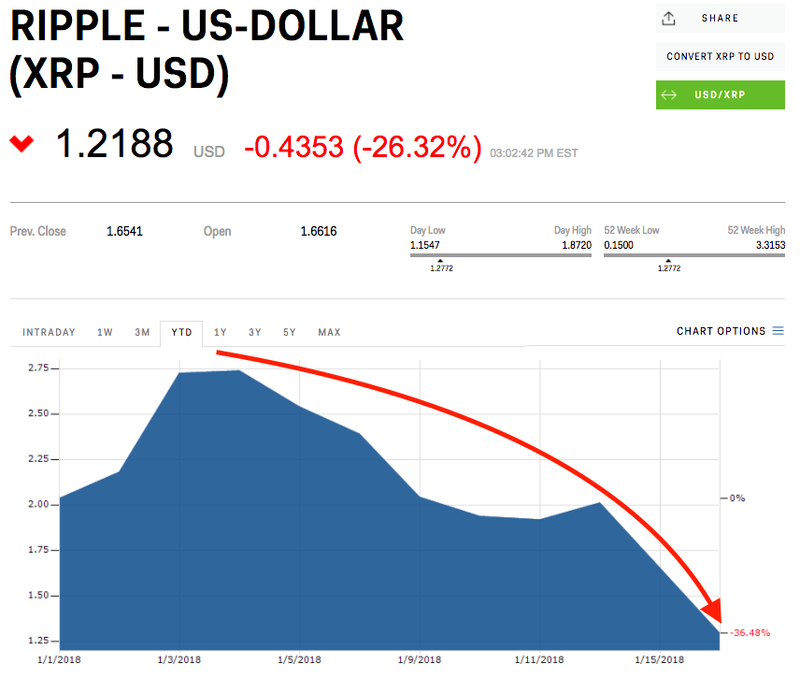 XRP’s downward spiral began early this year, when New York Times journalist Nathaniel Popper said on Twitter he was unable to corroborate many of the customers Ripple had claimed. Ripple CEO Brad Garlinghouse has denied these claims, saying interviews and proof had been made available to Popper. Things only got worse from there. On Monday, January 8, CoinMarketCap, one of the most viewed sites for cryptocurrency pricing data, unexpectedly removed pricing data from South Korean exchanges, where coins have been known to trade at significant premiums, appearing to send overall prices down and inducing further sell-offs across the cryptocurrency world. Later in the week, almost every single cryptocurrency took a hit after reports of further regulatory clampdowns on cryptocurrency mining and exchanges from China and South Korea, both of which are a huge focus for Ripple. "They have a bigger risk appetite," Asheesh Birla, Ripple’s VP of product, said of Asian banks in an interview last week. "We have a big emphasis in India and Japan. In the US market it has been a little bit slow to be honest. I am blown away with how fast these banks are digging into this; demand is off the charts." Ripple said in December that it holds 55 million XRP in escrow, a move that allows it to guarantee liquidity for large transactions and provide a confidence measure for the cryptocurrency. At Tuesday’s prices, those reserves could be worth $67.65 million if the company cashed them in. Bitcoin - easily the most valuable and well-known cryptocurrency - is also down in the past two weeks, though its losses are just 15% since January 20, compared to XRP's 37%. Tuesday’s XRP prices are still at a 4,204% premium to where the token was trading a year ago, but the dip will certainly call into question XRP's valuation relative to its cryptocurrency peers.